In the last three decades, the average cost of attending college has increased by over 1,00o percent and continue to rise at a rate higher than financial aid is expanding. Higher education is indeed in crisis and as students continue to graduate from college with mountains of debt into an unstable economy, many are asking how to further their education without accruing such debt. One such option is by pursuing that education at a tuition-free college. While it may come as a surprise to some that such a thing exists, there are, in fact, a number of colleges across the nation that offer high quality educational experiences without the burden of high tuition rates and fees. These Colleges fall into a number of different categories, but all share the basic trait of a commitment to graduating students without the need to take out large loans in their financial aid packages. Some tuition-free schools are grounded in a commitment to supporting regions of the country that have been historically impoverished (namely Appalachia), and thus may be open to admission only by students residing within that region. Another category of tuition-free school is the military academy which provides a four-year education with tuition, room, and board covered as well as often providing a monthly stipend for other living expenses. These schools do, however, provide their education without a price as graduates will be committed to a 5 year term of service in the military following graduation. Lastly, Elite and Ivy League schools frequently commit to providing an education without the need to take out loans and go into debt. Thus, students from middle and low-income families are typically granted financial aid packages of grants and scholarships that cover 100% of tuition and even room and board costs. Prospective students interested in receiving an education with the option of either free tuition or other financial assistance that drastically reduces the need to take out large loans can begin their search in this article where we have compiled a list of some of the best institutions offering this opportunity. Located in Pippa Passes, Kentucky, Alice Lloyd College is a four-year, Christian, liberal arts institution dedicated to providing leadership education to students in the Appalachian region. Established in 1923, Alice Lloyd offers bachelor’s degrees in Accounting and Business Management, Business Administration, English, History, Liberal Arts, Sociology, Sports and Fitness, Biology, Nursing, Education, and more. U.S. News & World Report ranks Alice Lloyd #7 in Regional Colleges South and #2 in Best Value Schools. Alice Lloyd College is committed to provide 100% tuition coverage to students residing in the 108 county (5 State) service area of Central Appalachia. Students engage in work study as a way to help defray the costs of running a tuition free college. Depending on work study hours, students may owe money for room/board or computer fees and matriculation fees (health, service, technology fee) though the cost of tuition is 100% guaranteed for all students in the service area. Located in Haviland, Kansas, Barclay College is a four-year evangelical-Quaker college established in 1918. The school enrolls just under 250 students in undergraduate and graduate programs with mostly ministerial focus. Bachelor’s degree programs are offered in Pastoral Ministry, Youth Ministry, Sports and Recreational Leadership, Christian Elementary Education, Business Administration, and more. Barclay also offers Associate’s degrees in Biblical Studies and General Studies, and Master’s programs in Family Ministries, Pastoral Ministries, Quaker Studies, Spiritual Formation, Transformational Leadership, and more. All resident students automatically receive a $15,000 full-tuition scholarship upon acceptance. College supporters fund the full-tuition scholarship so students may graduate with an excellent Christian education without the weight of a debt mountain. While Barclay does offer a variety of online degree programs, the full-tuition guarantee is offered only to residential students. Established in 1855, Berea College is a private liberal arts college located in Berea Kentucky. Founded by ardent abolitionists and radical reformers, Berea continues today as an educational institution still firmly rooted in its historic purpose “to promote the cause of Christ.” The college provides degrees in 28 fields and enrolls over 1,500 students from across the country, but is mainly focused on educating students from the Appalachian region. Berea is the only one of America’s top colleges that makes a no-tuition promise to every enrolled student. The generous Tuition Promise Scholarship makes it possible for students to graduate debt-free. For most Berea students, the Tuition Promise Scholarship amounts to nearly $100,000 over four years. Even if students borrow for special learning opportunities or to replace their family’s total contribution, students will have a low debt compared to national trends. Located in Point Lookout, Missouri, College of the Ozarks is a private, Christian liberal arts college that was founded in 1906. The mission of the College is to provide the advantages of a Christian education for youth without sufficient means to procure a higher education. The college has an enrollment of just over 1,500 in undergraduate degree programs in close to 30 majors as well as pre-professional programs. College of the Ozarks is committed to providing tuition free education. Each student participates in the on-campus work program for 15 hours per week and two forty-hour work weeks per school year. Credits from participation in the work program, any federal and/or state aid for which students qualify, and the College of the Ozarks Cost of Education Scholarship combine to cover the total cost of education. There are no student loans involved and there is no cash due from students for cost of education. Established in 1865, Cornell University is a privately endowed research university and a partner of the State University of New York. As the federal land-grant institution in New York State, Cornell has a responsibility—unique within the Ivy League—to make contributions in all fields of knowledge in a manner that prioritizes public engagement to help improve the quality of life in New York state, the nation, the world. Cornell is located in Ithaca, New York and enrolls nearly 22,000 students. With an acceptance rate of over 10%, Cornell is the Ivy League institution with the highest acceptance rate. Cornell’s financial aid policy commits to offering full-ride scholarships to students from middle and lower-middle income families. For students from families earning under $60,000 annually, Cornell is committed to ensuring that students can pay for tuition without taking out a loan. The Curtis Institute of Music, established in 1924, is a conservatory in Philadelphia that offers courses of study leading to a performance diploma, Bachelor of Music, Master of Music in Opera, or Professional Studies Certificate in Opera. The school is located in Philadelphia, PA and enrolls a small student body of 175 students. The Curtis Institute of Music, known as one of the leading conservatories in the world, provides training and education to gifted musicians for careers as performing artists at the highest professional level. With an average acceptance rate around 4 percent, Curtis is among the most selective schools in the United States. Its high standard of admissions ensures that students will rehearse and perform alongside musical peers whose talents will challenge and inspire them. All Curtis students receive merit-based, full-tuition scholarships. As a result, talent and artistic promise are the only considerations for admission. Generous financial aid likewise ensures that no student accepted to Curtis will be unable to attend because of financial need. Deep Springs College is an alternative, two-year college located in Deep Springs California. Founded in 1917, the college offers a unique learning experience among higher learning institutions built on academics, self-government, and manual labor. 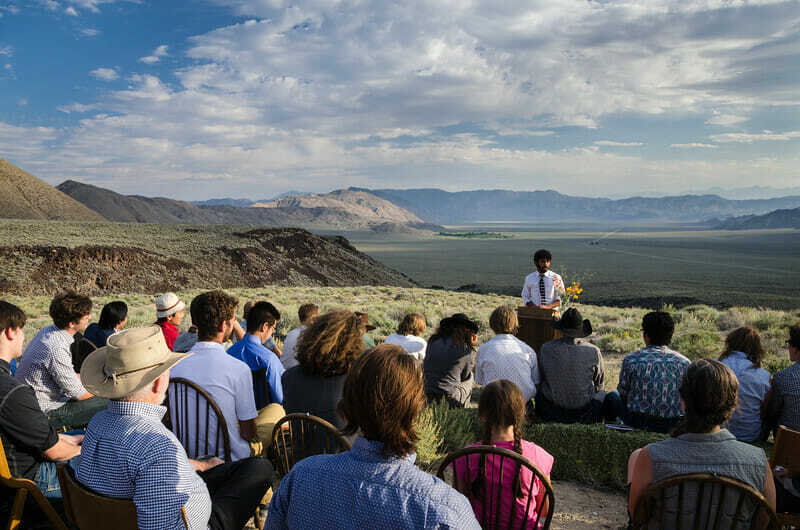 Deep Springs admits a student body of no more than students each year and is accredited to offer associates degrees for students who typically go on to earn a bachelor’s degree or higher at some of the nation’s top universities. A scholarship covers the costs of tuition, room, and board for every student offered admission. In exchange, Deep Springs students are expected to dedicate themselves to lives of service to humanity. Every student engages in labor on Deep Springs campus as both an integral pillar of their education and as a way to help defray the costs of offering this free educational opportunity. Duke University is a private research university located in Durham, North Carolina. Founded in 1838, today, Duke enrolls over 15,000 students in a wide variety of programs through 10 schools and colleges. Duke is often ranked among the best universities in the world and has highly selective admissions. Duke expects a minimum contribution from a first-year student of $2,600 per year, regardless of income. Families with a total annual income of $60,000 or less, and typical assets, will have an expected parent contribution of $0. Once they’ve determined your family contribution, they’ll build your financial aid award. The financial aid award may consist of work study, limited student loans*, grants, and scholarships. Established in 1636, Harvard University is a private Ivy League research university in Cambridge, Massachusetts, Harvard is widely recognized as one of the most prestigious universities in the World and has one of the most selective admissions policies as well admitting under 6% of all applicants annually. Harvard enrolls approximately 22,000 students. Harvard’s financial aid programs pay 100 percent of tuition, fees, room, and board for students from families earning less than $65,000 a year. Families with incomes from $65,000 to $150,000 pay between zero and 10 percent of their income. Established in 2001, Macaulay Honors College at CUNY is a highly selective college where New York’s most promising students receive the financial and academic support to realize their leadership potential. Macaulay students enroll as undergraduates in one of eight CUNY colleges. They take most of their courses at their home campus where they can meet with advisors and other students in the campus’s honors lounge. Macaulay offers all of its students a merit scholarship package that includes tuition, a laptop computer, Cultural Passport and access to the Opportunities Fund (subject to the availability of funds). Students who meet CUNY New York State residency requirements for in-state tuition have the opportunity to graduate free from tuition debt thanks to the tuition scholarship. It covers four years of undergraduate study excluding fees and expenses. Located in Cambridge, Massachusetts, the Massachusetts Institute of Technology is an independent, coeducational, privately endowed university, organized into five Schools. It enrolls over 11,000 students and is at the forefront of interdisciplinary exploration leading to scientific breakthroughs and technological advances. At its founding in 1861, MIT was an educational innovation, a community of hands-on problem solvers in love with fundamental science and eager to make the world a better place. Today, that spirit still guides how we educate students on campus and how we shape new digital learning technologies to make MIT teaching accessible to millions of learners around the world. For students with family incomes under $90,000 a year, the Institute continues to ensure that scholarship funding will allow them to attend MIT tuition-free, a policy put in place in 2008. In the 2016 academic year, 33% of undergraduates (1,489 students) received scholarships and grants from all sources equal to or greater than tuition, of which 1,060 students, or 24% of undergraduates, had incomes under $80,000. Remaining expenses are covered by the student or their family through paid work or student loans. Located in Princeton, New Jersey, Princeton University is a private, Ivy League institution with a longstanding commitment to service of the nation and humanity. Established in 1746, Princeton is the fourth-oldest college in the nation. Princeton enrolls over 10,000 students in undergraduate and graduate programs in the humanities, social sciences, natural sciences, and engineering. Princeton University’s financial aid policy is recognized as among the most generous in the country. The University’s robust financial aid packages are built on grants rather than loans, which allow students to graduate debt free. This makes a Princeton education affordable for any student who is admitted to the University. In fact, Princeton is likely to be more affordable than a state university for lower- and middle-income students. 100% of costs for families earning up to $65,000 are covered. Located in Stanford, California in the Silicon Valley, Stanford University is a private research university often recognized as one of the the world’s most prestigious universities. Established in 1891, Stanford enrolls over 16,000 students and offers undergraduate and graduate degree program in a wide variety of academic and professional disciplines. With a 7% admission rate, Stanford is one of the most selective universities for undergraduate admission. Stanford is committed to providing tuition free education for students of low and middle income families. Students from families with an annual income of less than $125,000 do not pay a cent toward tuition. Additionally students from families making less than $65,000 are offered free room and board. 77% of Stanford undergraduate students graduate with no student debt. Founded in 1876, Texas A&M University is a coeducational public research university in College Station, Texas, United States. It is a state university and since 1948 is a member and the flagship of the Texas A&M University System. TAMU enrolls almost 69,000 students in undergraduate and graduate level academic and professional programs through 10 colleges and schools. TAMU’s Aggie Assurance program aids students with family income of $60,000 or less by pledging to provide enough scholarships and grants to pay tuition for all eligible students. To be eligible students must reside in Texas and enter the university as a freshman or undergraduate transfer student and must enroll full-time maintaining a 2.5 grade point average. The United States Air Force Academy, is a military academy for officer cadets of the United States Air Force. Its campus is located in the western United States in Colorado, immediately north of Colorado Springs in El Paso County. While the academy focuses on preparing students to serve as officers in the Air Force, students have an option of studying from up to 27 different majors. The school enrolls 4,000 students. Tuition along with room and board are all paid for by the Air Force. Cadets receive a monthly stipend, but incur a commitment to serve a minimum of 5 years of military service after graduation. Located on the Thames River in New London, Connecticut, the U.S. Coast Guard Academy is educates leaders of a multi-mission, maritime military force. The school provides a four-year Bachelor of Science degree program. Each year, approximately 200 ensigns (or junior officers) are commissioned during graduation exercises in May. Following graduation, newly commissioned ensigns report for duty aboard cutters and at sector offices in ports nationwide. Graduates of the Academy are obligated to serve five years in the U.S. Coast Guard, though many choose to stay and make a rewarding, life-long career of their maritime military service. The Academy covers the full cost of tuition with a full scholarship for each individual. This is repaid through five years of service in the Coast Guard following the student’s graduation. The United States Merchant Marine Academy is a federal service academy that educates and graduates licensed Merchant Marine officers of exemplary character who serve America’s marine transportation and defense needs in peace and war. The academy is located in Kings Point, New York and enrolls just over 900 students. Known for its rigorous academic program, USMMA requires more credit hours for a baccalaureate degree than any other Federal service academy. The U.S. Merchant Marine Academy does not charge tuition for students. However, students are billed an average of $850 per year for services including laundry, tailor, and barber. Additionally students will incur costs for un-billed expenses including transportation, general supplies, health insurance, plebe laptop package, and others. These costs are minimal considering tuition and room/board are covered by the Merchant Marine Academy. Unlike the nation’s other Federal Service Academies, graduates of USMMA are required to fulfill their service obligation on their own by providing annual proof of employment in a wide variety of occupations as approved by MARAD for a specified period of time. Also known as West Point the United States Military Academy is located in West Point, New York. West Point provides a 47-month leader-development program steeped in academic rigor, military discipline, and physical challenges, all built upon a moral-ethical foundation. Students can choose from among 36 different academic majors leading to a bachelor’s degree. Curriculum is designed to meet the needs of the Army for officer-leaders of character to serve in the Army and the Nation. Each year the United States Military Academy admits 1,150 to 1,200 young men and women. A West Point cadetship includes a fully funded four-year college education. Tuition, room, board, medical and dental care are provided by the U.S. Army. A cadet earns about $600 a month or nearly $7,200 a year. In turn graduates serve for five years on active duty in the army. If choosing to depart the Army after five years, graduates will be required to serve three years in Inactive Ready Reserve. As the undergraduate college of our country’s naval service, the United States Naval Academy prepares young men and women to become professional officers of competence, character, and compassion in the U.S. Navy and Marine Corps. Located in Annapolis, Maryland, the Naval Academy enrolls over 4,500 students in academic programs designed to develop Midshipmen morally, mentally, and physically, and to imbue them with the highest ideals of duty, honor, and loyalty in order to graduate leaders dedicated to a career of naval service. Naval Academy students are midshipmen on active duty in the U.S. Navy. They attend the academy for four years, graduating with bachelor of science degrees and commissions as ensigns in the Navy or second lieutenants in the Marine Corps. The Navy pays 100% of the tuition, room, and board, medical and dental care costs of Naval Academy midshipmen. This means ALL students who attend the Naval Academy do so on a full scholarship in return for 5 years of active duty service upon graduation. Additionally, you also enjoy regular active-duty benefits including access to military commissaries and exchanges, commercial transportation and lodging discounts and the ability to fly space-available in military aircraft around the world. Midshipmen pay is $1,087.80 monthly, from which laundry, barber, cobbler, activities fees, yearbook and other service charges are deducted. Actual cash pay is $100 per month your first year, which increases each year thereafter. The University of Missouri was founded in 1839 in Columbia as the first public university west of the Mississippi River. Today, with an enrollment of more than 30,000 students, the University offers more than 300 degree programs through 19 colleges and schools. It is one of only six public universities nationwide that can claim a medical school, veterinary medicine college, and law school on the same campus. The University of Missouri—Columbia recently introduced a dramatical expanded financial aid program that covers 100% of Honors College students tuition not met by federal Pell grants. This program covers room and board as well as tuition costs. One of 17 campuses in the University of North Carolina System, Chapel Hill was founded in 1795 and is one of three schools claiming the title of the oldest public university in the United States. UNC—Chapel Hill is a public research university located in Chapel Hill, North Carolina, enrolling nearly 30,000 students. It is considered among the Public Ivies, or schools providing an Ivy League academic experience for the price of a public institution. UNC Chapel Hill offers 71 bachelor’s, 107 master’s and 74 doctoral degree programs. UNC—Chapel Hill’s Carolina Covenant Program promises UNC’s lowest-income students the opportunity for a debt-free education. Undergraduate students with family income at or below 2005 of the federal poverty level—about $48,500 for a family of four—may be eligible for the Covenant. The program is open to both first-year students and transfers. The Covenant makes it possible to graduate debt-free and meets financial need through grants and scholarships without the need for students to take out loans. Students of the Covenant commit to work study and summer school. Located in Nashville, Tennessee, Vanderbilt University is a private research university founded in 1873. Vanderbilt offers undergraduate programs in the liberal arts and sciences, engineering, music, education and human development, as well as a full range of graduate and professional degrees. Vanderbilt enrolls over 12,000 students. It is an internationally recognized research university with strong partnerships among its 10 schools, neighboring institutions, and the community. At Vanderbilt University, need-based financial aid packages for all undergraduate students no longer include need-based loans. This means that all need-based aid is met by scholarship and/or grant (gift) assistance so that students can graduate debt free. Webb Institute is a private undergraduate engineering college in Glen Cove, New York on Long Island. Each graduate of Webb Institute earns a Bachelor of Science degree in naval architecture and marine engineering. Webb is the only school in the nation devoted to ship-design engineering and systems engineering. Webb Institute enrolls just 80 students and is considered among the best engineering schools in the nation. Webb Institute provides all enrolled students full-tuition scholarships to U.S. citizens and permanent residents, valued at $48,350 for the 2017-2018 academic year. Webb Institute also offers need-based aid to help cover additional costs of attending. It is also the only full-tuition scholarship private undergraduate program of its kind in the country. Founded in 1888, Williamson College of the Trades is a men’s junior vocational college located in Middletown Township near Media, Pennsylvania, a suburb of Philadelphia. The school is centered on Judeo-Christian values and perspective and offers programs in carpentry, horticulture, machine tool technology, masonry, paint and coatings, and power plant technology. Programs lead to an associate’s degree. All students attend on full scholarships that cover tuition, room, board, and textbooks. Students pay entrance costs for personal items, annual fees for certain equipment and books that they retain for personal use, and annual fees for breakage and yearbook. Yale University is an American private Ivy League research university in New Haven, Connecticut. Founded in 1701, it is the third-oldest institution of higher education in the United States. Yale enrolls over 12,000 students in a full range of undergraduate and graduate programs organized into fourteen schools and colleges. As an Ivy League institution, Yale is an internationally recognized leader with top schools in law, medicine, management, and more. Yale is committed to an admissions policy that does not consider a student’s ability to pay, and a financial aid policy that meets the full need of all students with no loans required. These two principles: need-blind admissions and need-based financial aid, ensure that a Yale education is affordable for everyone, regardless of family background, citizenship, or immigration status. Yale’s financial aid evaluation process is holistic. Financial aid officers review every aid application carefully to ensure they understand each family’s individual financial situation. Yale is committed to meeting 100% of every student’s need to ensure that students can graduate debt free. This concludes our ranking of 25 Tuition Free Colleges.